Circular Insanity | A Shopaholic's Guide to Shoes, Beauty,Books and Reviews | Beauty Blog: New Realflex From Reebok And My Thoughts! New Realflex From Reebok And My Thoughts! I am not really a sport shoe kind of a person but these days I have been walking A LOT so I had to finally take my Reebok shoes out. As a result, they are in a very bad shape, in fact one of the sole came out but since that happened in the past just after few days of buying it, I haven't paid much attention(Is it just me or the Reebok soles do come off very early? I have seen 2-3 case just like mine) Anyway, I have no pictures of me wearing the shoes because I was engrossed in weighing the pros and cons of Realflex, so I will just show you how it looks from the website. Also, what is with people in Pune, I have been told thrice till now to try out the footwear for men.Seriously, dude! I am only a Rbk 7/Adidas 8 (fluctuate between 40-41 depending on the fit), it is not like I am a size 10..hmph! What's the deal with Realflex? 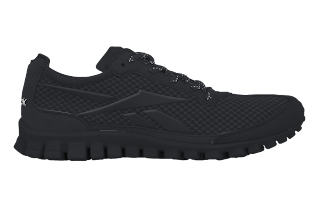 Well, these shoes have about 76 sensors in the sole and they have been designed to give you the protection of a trainer while giving you the comfort of a bare feet. The sensors will adapt according to the surface so that your shoe doesn't hinder your natural movement. You see, the thing is, when you run bare feet, the shock is taken by your muscles and doesn't affect your joints so, these shoes will take care of harsh terrain, roads, anything and everything! I did not end up buying them, I love shoes but sometimes you just have to draw a line somewhere.Also, I have a mental block against buying expensive shoes which are not drop-dead-gorgeous!